First things first: there is no security risk. The alert you are seeing is specific to the Google Chrome and Apple Safari browsers. It is due to the processing time it takes for the browser to update with the latest certificate information. If you are using a PC, you can manually resolve the issue by clearing your cache in your browser and refreshing the page at huecu.org. This will force the browser to access the most up-to-date certificate information and the issue should be resolved. If you are using a Mac computer, clearing the cache will not resolve the alert. Please know that your information remains encrypted and secure. Apple has yet to release a system update that certifies the latest web certificates. This is solely a Mac issue and we are currently working on a resolution. Again, your data remains safe and secure. For more detailed information, visit the Google Chrome Help Center. Depending on your operating system and browser version, there are multiple different solutions to clear your cache in Safari. For specific instructions, visit the Apple Support Center. 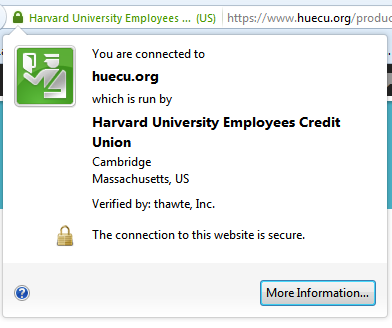 After clearing the cache in your browser, you should now see the valid, verified security certificate.